The cartographic viewer provides information about the chemical quality status of the Galician coastal water (mainly), based on chemical pollutants and ecotoxicity bioassays data. The data comes from two sources: literature and unpublished data collected by the group. The chemical quality status is represented by a traffic light color code, similar to the one used by the OSPAR Commission in its Quality Status Report, for what they propose as cut-off points to separate the different environmental states as a function of concentrations or response metrics. 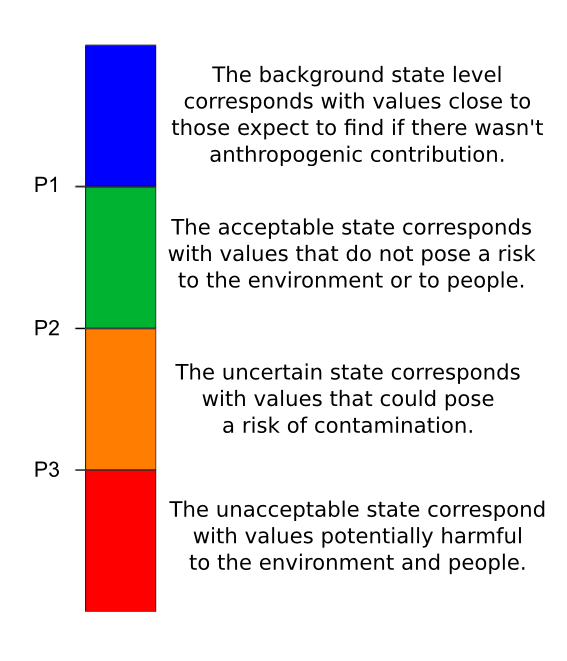 It has been used three boundary values or cutoff points (P1, P2 and P3) which leads to four ecological states: background, acceptable, uncertain and unacceptable (fig. 1). Fig. 1. - Chemical Quality Status. The cutoff points are established taking into account the criteria of the OSPAR Commission and scientific studies widely accepted by the scientific community and supranational organizations, selecting the most appropriate for each type of chemical contaminant and for each ecotoxicological response. Chemical pollution data currently available is: concentrations of metals and polycyclic aromatic hydrocarbons (PAHs) in sediments (cutoff points in table 1 and table 2) and wild mussels (cutoff points table 4 and table 5), and ecotoxicity bioassays (PNR values) using sea-urchin larvae exposed to water and elutriates (aqueous extraction of the sediment) (cutoff points in table 3). Data is grouped in five-year periods, given the stability of the sediment, yielding three study periods: 1997-2001, 2002-2006 and 2007-2011, selecting the worst state for the same station when more than one value is available. Table 1. Cutoff values for metals in sediments (mg/kg DW). Table 2. Cutoff values for PAHs in sediments (µg/kg DW). Table 3. Cutoff values for ecotoxicological data for sea urchin (PNR). Table 4. Cutoff values for metals in wild mussels (mg/kg DW). Table 5. Cutoff values for PAHs in wild mussels (µg/kg DW). (11) CCAC: CRISISMAR's thresholds for concentrations ranges. Environmental Quality Criteria for Marine Ecosystems. Research Project CRISISMAR, Ref. CTM 2009-10908: 1-20.